I figured that since we seem to have hit a wall, I decided to spent the week training up my b-team mechwarriors. I placed a limitation for myself in this run. I said that I would only hire mechwarriors that are tagged as “Kickstarter Backer” or “Ronin”. They aren’t quite as rare as you may think. Just check the hiring halls on each planet you visit. Medusa would take my place on the field as captain. The rest of the b-team consisted of Varangian as multirole, Apex as sniper, and Strider as artillery. But on the higher skulled mission I would switch to my a-team until the b-team was ready. While on an assassination mission in Taurian space, radar picks up a 90 ton mech as the target. Oooh, baby. One sensor lock later and it’s revealed to be a Highlander. The HGN-733P variant; that’s the energy weapons version with the PPC. In other words, perfect for my current play style. Not only is the Highlander my favorite battlemech, but it shares it’s name with a kickass tv show from the 90’s. The target went down after four injuries. After the mission I went into the garage and reconfigured the Highlander into a beast of a machine. The damage output on this thing is devastating. In other words, one bad mofo. Check the slideshow down below for details. It was on a standard ‘battle’ mission. I read online that if you keep the side of a mech facing the enemy, the chance of them getting a headshot is significantly decreased, as their shots would hit the arm and side torso. The three headshots that the Highlander received prior to the last one begs to differ. A PCC carrying Cicada runs out of LOS, fires, and that was the end for Medusa. The hospital is installed on the Argo, but only increases the chance of survival by about 3% I think. Even the game couldn’t believe my luck, as it started glitching right after. The wasd keys, tab, and screenshot keys stopped working. Medusa was at level 9 in all skills. Mockingbird would take over for Medusa and I would continue to train them. I took them to a four skull “Lost Contact” recovery mission. I figured they’ll be fine. We see two 80 ton assault mechs show up on radar. They turn out to be a Zeus and an Awesome. Remember that I still have to commit war crimes on Smithon. I drop them both, and I can choose 5 peice of salvage on this mission. I take the Zeus, and for that, I believe the other gods smiled upon me, and rewarded me with the final piece of the Awesome. Being a pure energy weapons platform, I won’t be using the Awesome. I only need one PPC… For now… As for the Zeus, it’s basically the Orion-K but with slightly better heat efficiency. As an assault, my sniper would also fall into the last movement phase of the round. Right now, everyone moves in phase 2, and I’d rather keep it there for the time being. The Zeus just isn’t good enough to justify the switch. Later on, I went on a 4.5 skull assassination mission and ran into a Victor. The war criminal went down in 4 pilot injuries. But again, I won’t be using the Victor. It was at this time that I decided that I might as well go back to Smithon and do the next priority mission. But I decided to play a little bit more as I watched some esports on the side. 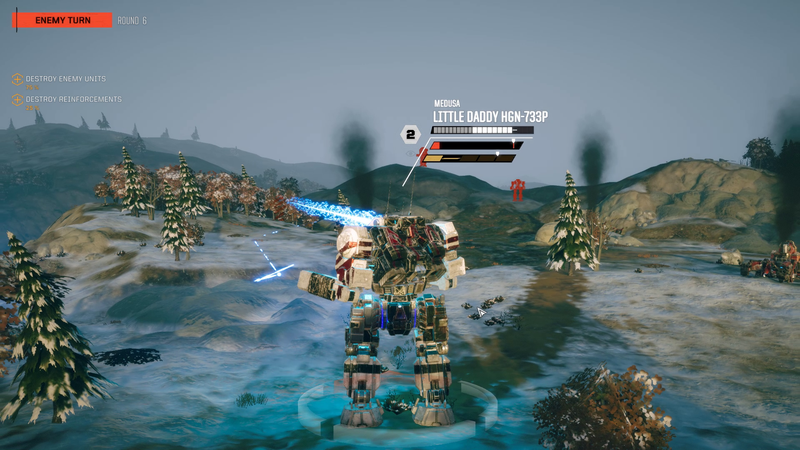 But of course, as I was doing a base capture mission, I run into a 95 ton mech. What could this bad boy be? Two PPC shots comes flying from its direction. What’s 95 tons and carries two PPCs? Who’s that pokemech?! It’s a heavily armor damaged Banshee. Capellen forces said that they would soften the targets up. A sentinel was piloting it, and after 5 injuries, it stayed down. But again, I won’t be using it, probably ever. Not just because it doesn’t fit with my current style, but also because the damn thing runs like it’s in the center of a white dwarf. Instead of cooling fluid its gotta be running plasma through its heat sinks. The last thing I want to do is bring it to a mission on a martian biome. Which is where we’re going next. Time to commit some war crimes. All Kamea needs to do is pretend like we’re using drones instead of battlemechs on the front lines. Apparently that makes it okay. Out of sight, out of mind, ladies and gentlemen.